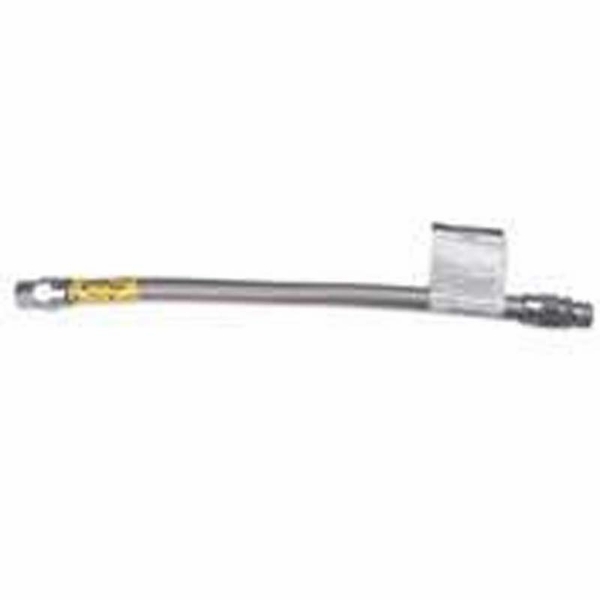 You can connect all sorts of gas appliances using this simple 24 Inch Flexible Stainless Steel Gas Line. This line provides a stable and secure connection between the appliance and gas pipes, plus it has some flexibility to allow you to conform to different placement situations and different pipe setups. The line is 24 inches long and is constructed of tough, durable, and incredibly safe stainless steel. Gas connections require incredibly secure and damage-resistant components, which is exactly what this flexible gas line is. Is this a corrugated or smooth surface inside? This has a corrugated surface. Standard gas line connectors will have 1/2 inch flare fittings and an outer diameter of 3/8 of an inch on both ends. 3/8 male threading? I'm looking for 3/8 female on both ends for a gas ventless fireplace. Thank you for your patience. We have been informed by our suppliers that we do not have access to a flex connector with 3/8" female fittings on each end. I apologize for any inconvenience. Is this 1/4" or 3/8" line? This flex line has 3/8" threading on both sides. Can the stainless gas line be used to connect a fireplace gas log set up? I looked for this product and Lowe�€™s Home Depot and Ace Hardware stores�€� I was unable to locate it. I finally found it at the fireplace store. Don�€™t shop around different places if you need something for your fireplace, just come right here and save time. My brother-in-law introduced me to this site and I am so glad he did. I�€™ll be shopping here, again in the future for my fireplace needs.